Graduate Education Week, NC State’s annual celebration of graduate students and graduate education, will run March 17-23 this year. 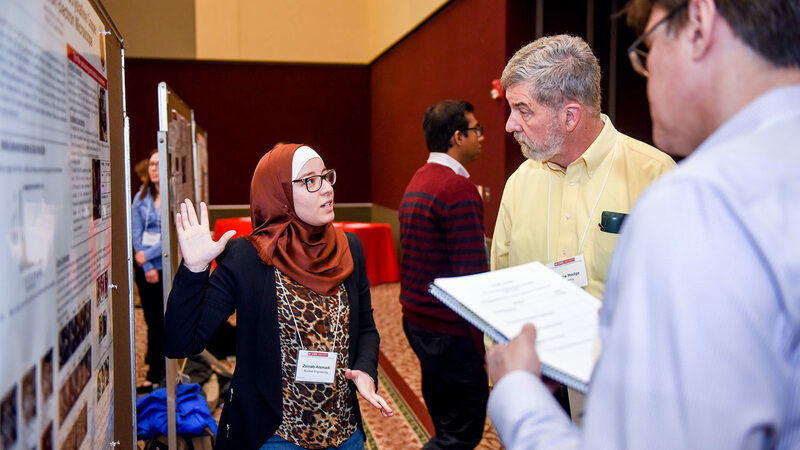 The signature event is the Graduate Student Research Symposium on March 20, 1:30-4 p.m.
At the symposium, more than 200 students from over 70 graduate programs will present posters about their research projects. Posters are judged, and winners will be named in various discipline categories following the end of the poster session. Read abstracts for the students’ research posters. Students are encouraged to come out to support their peers and learn about the great think-and-do research taking place at NC State. The symposium is sponsored by the Graduate School and the Graduate Student Association. In addition, two faculty members will be recognized as winners of the Graduate School’s Outstanding Graduate Faculty Mentor awards. The awards will be presented at the close of the poster session. Students are also invited to participate in several other Graduate Education Week events sponsored by the Graduate School. Graduate students: Come by 201 Witherspoon Student Center any time between 8 a.m. and 4 p.m. on March 19 to de-stress. Indulge in stress-relieving activities, dim lighting and a comfortable community of fellow graduate students while you let your mid-semester anxiety melt away. Co-sponsored by the Graduate School and the Graduate Student Association. Stop by the Graduate School offices March 21, 9-11 a.m., to find out how our staff can support you through your graduate school experience. Students also can participate in a favorite Graduate School staff activity – tasting and voting on the best donuts. What’s your favorite donut? Find out how it stacks up! Sponsored by the Graduate School. Note: Please check event websites – registration is required for some events. Two workshops: 9 a.m.-noon and 1:30-4 p.m.